Biomedical Psychiatric Therapeutics presents the basic principles of biomedical psychiatric therapeutics. It discusses special areas of major clinical importance where biomedical psychiatry connects with chemical dependencies. It addresses the advances in biological exploration of psychiatric disorders that have a major impact on biomedical psychiatric therapeutics. 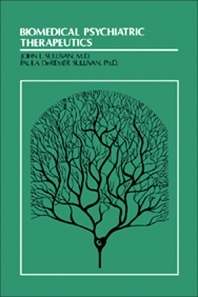 Some of the topics covered in the book are the chemotherapy of anxiety; treatment of alcohol withdrawal; use of anxiolytics in patients with medical illness; chemotherapy of affective disorders; monoamine oxidase inhibitors; atypical antidepressants; indications for lithium therapy; and treatments for manic-depressive disease. The chemotherapy of schizophrenia is fully covered. The electroconvulsive therapy is discussed in detail. The text describes in depth the systemic morbidity and mortality. The effect of electroconvulsive therapy in the central nervous system is presented completely. A chapter is devoted to the use of the clinical laboratory. Another section focuses on the chromosomal abnormalities. The book can provide useful information to psychologists, doctors, students, and researchers.